As more temperate weather is underway, you know where you want to be – outside. Part of that plan may involve creating an area where you can enjoy the outdoor weather while still having a structure that makes that enjoyment easier, such as a deck. How do you plan a deck that meets your needs? Here are some basic aspects to consider when planning your new deck. Decks are typically lifted from the level of the ground, usually the same height or very close to the level of one of your home’s floors. This makes it easier to get onto your deck without having to deal with a lot of stairs. This means that soil strength and a good foundation is vital to the stability and safety of your deck. You’ll want to see what is standard practice in your area, whether it’s a foundation pit filled with gravel for drainage, concrete piers buried in the soil or concrete blocks placed at the level of the soil surface with gravel beneath it to prevent ice heaves. Once you’ve figured out your foundation, you’ll need to frame the floor for the deck. Many times, this involves using pressure-treated lumber, because it is strong and resistant to rot. However, many homeowners are more concerned with the chemicals used in the pressure treatment process. Other options you can consider include naturally rot-resistant woods, such as cedar. Now that you’ve figured out a solid foundation and frame, you’ll need to think about decking materials, which form the “floor” of your deck. Common options include wood and composite materials, each with their own benefits and drawbacks. Wood decking includes pressure-treated wood, which can contain chemicals that are of concern to some homeowners, cedar, which is naturally rot resistant but softer and more easily damaged, and ipe, a South American wood that is both hard and rot resistant, providing years of reliable service but at a higher cost. Composite decking often uses recycled material, but sometimes requires specialty fasteners to lock the boards in place. Clemens Jellema, deck contractor and owner of Fine Decks, creates outdoor living areas with Fiberon composite decking and railing. In the video below Clemens says, “It’s a beautiful product”. With his history of furniture making, professional builder Clemens Jellema understands the allure of natural wood. What’s your home’s style? A modern deck may look strange tacked onto a Victorian, while the strong beams of Craftsman construction provide a good backdrop to a more modern rail on a new deck. Make sure you take your home’s existing roofline, style and accents into account when planning your new deck. You may also want to consider what the new deck will bring into view, such as whether it will compromise privacy by raising the level of the observer to the same level as a bathroom or bedroom window. One of the biggest ways you can impact the overall appearance of your deck is what you choose for railings. For a more modern home, you may want to work with metal or wood rails with cable providing safety below the rail. 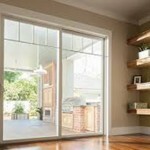 If you have a beautiful vista, you may want to consider using glass beneath a metal or wood rail. If you need something easy to maintain, PVC may be an excellent option. If you don’t prefer the usual post, rail and banister appearance, there are many options to consider. If you take the time now to plan your deck, you can quickly figure out what it will cost, how long it will take to build and how the appearance will compliment your home’s style. If you need assistance finding the right materials or need to special order a particular item, please feel free to contact the experienced associates at Poulin Lumber. We’re happy to help you get your deck project moving.